Ultrasound uses sound waves and a computer to create images of internal organs and blood vessels. It has a variety of applications for almost all the organs in your body. Ultrasound can be used to detect abnormalities in your blood vessels, and frequently is used to evaluate fetal anatomy and growth during pregnancy. An instrument called a transducer is placed over the area of the body being examined. This transducer emits sounds waves. Next, the sound waves bounce off the organ or structure being evaluated in your body and those sound waves now come back to the transducer that sent them in the form of “echoes”. The images are then sent to the computer and the data is analyzed. 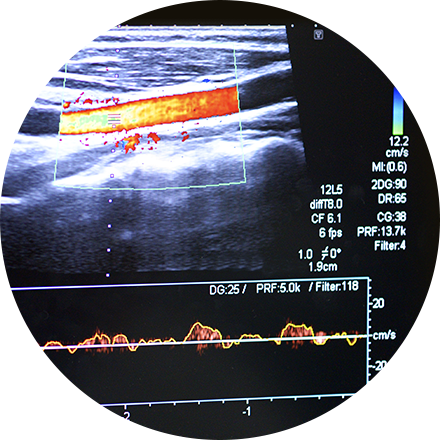 Ultrasound has a wide range of applications, from adult bone studies to fetal heart rate monitors. It helps clinicians assess the organs and blood vessels in the abdomen (liver, kidneys, spleen, gallbladder, bile ducts, aorta and pancreas). It also helps in evaluating organs in the pelvic area (uterus, ovaries, bladder, and prostate). Most obstetricians perform a routine diagnostic ultrasound to look for any abnormalities with either the fetus or the mother’s anatomy during early pregnancy. The breast, thyroid gland and scrotum are well evaluated with ultrasound, as are soft tissue masses in your extremities and elsewhere. Ultrasound is very useful in studying both arteries and veins throughout your neck, chest, abdomen, and extremities. Doppler ultrasound (to visualize blood flow through a blood vessel). Abdominal ultrasound (to evaluate the gallbladder, liver and other abdominal organs). Thyroid ultrasound (to monitor nodules). Fetal ultrasound (to view the fetus in pregnancy). Doppler fetal heart rate monitors (to listen to the fetal heart beat). A water-based gel is applied to the skin over the area to be examined to block any air between the skin and transducer, to eliminate friction on the skin, and provide the best quality images. The technologist then will place the transducer over the area that will be examined. For certain indications like female bleeding, fibroids, ovarian cysts and pelvic pain, two types of transducers may be used. You will be able to communicate with the technician during the procedure. There is no ionizing radiation exposure with this procedure. Ultrasounds are painless, non-invasive and have the highest safety use in all of radiologic imaging. However, we still practice prudent use of ultrasound and specific modes of imaging, especially for obstetrical sonography.